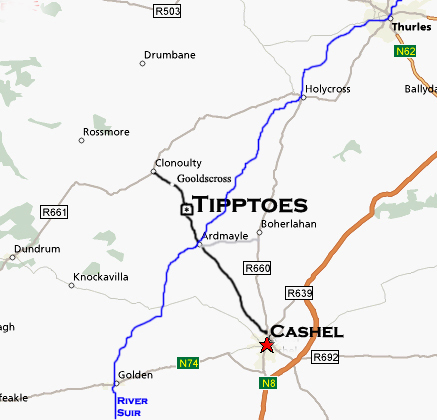 Address: TippToes, Gooldscross, Cashel, Co. Tipperary, Ireland. From Cashel: As you enter Cashel town from the Dublin side, you will pass an Esso Station on your right hand side. Just past the Esso Station there is a turn to the right, this goes down the back of the Esso Station and leads to a green area at the bottom of the hill - take the second left turn which is signposted for Ardmayle/Gooldscross - we are five miles out this road on the right hand side. From Tipperary: Take the Thurles road from Tipperary, as you come into Clonoulty there is a turn to the right - follow this road for two miles (passing through Gooldscross) and you will find us on the left hand side. From Thurles: Take the Tipperary road from Thurles, as you exit Clonoulty there is a turn to the left - follow this road for two miles (passing through Gooldscross) and you will find us on the left hand side.